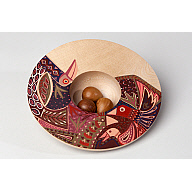 Small turned wood rocking bowl with broad lip hand painted with a hen and colourful feathers. Inside the bowl are the hen's three eggs. By Mick O'Donnell of Thurso, 1988.